Talk about an event Tia Mowry- Hardrict will never forget! Before welcoming her second child with husband Cory Hardrict, the Hollywood actress was treated to a baby shower this weekend with her closest family and friends. Held at Il Pastaio in Beverly Hills, the intimate co-ed gathering planned by Mindy Weiss featured plenty of special surprises including an unexpected performance from Kenny Latimore. "I had no idea that was happening at all," Tia shared with E! News exclusively after celebrating. "My husband, I have to say he's pretty good at surprises. We've been together for 19 years and never have I been able to figure out anything that he does in regards to surprising me...I was mind blown." 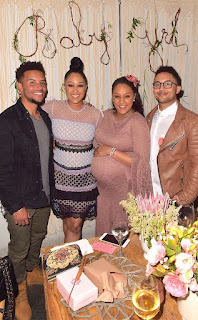 Guests including Tamera Mowry-Housley and Tahj Mowry watched the musician sing the very song that was played at Tia's wedding. And with the couple's anniversary coming up on April 20, it was even more special. "I just started crying," the Sister, Sister star shared with us. "There was not a dry eye in the house." Fortunately, there was plenty of fun included in the Easter weekend celebration. Those in attendance enjoyed a henna tattoo artist, dessert from Joanie & Leigh's Cakes, Italian food and the chance to guess the name of baby No. 2. And perhaps the cherry on top to all the family-friendly activities was the ambiance Mindy and Tia planned for everyone who attended. "She definitely wanted a boho, bohemian feeling shower where it was very cozy and spiritual," Mindy shared with E! News after sharing images on her social media account. "We hung dream catchers and twinkle lights and beautiful crystals and things from the trees…She wanted all her flowers [from Gilly Flowers] to be succulents and real natural, organic type flowers. And lots of candles!" Shower details aside, Tia is more than excited to expand her family that already includes her son Cree. In fact, he couldn't be more excited to become a big brother. "He's very happy. He's very thrilled," she explained. "[I'm] just trying to get him to feel as involved as possible because I want this transition to be smooth for him. Overall, he's very thrilled and more than anything, he's very considerate of my feelings or how I'm feeling." Tia added, "I love my family. I feel very, very blessed."